This is from a recent birthday party. 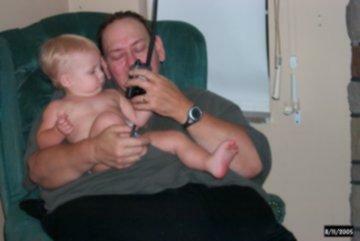 My first grand child Autumn Lynn who is an amateur radio operator in training. She heard repeaters ID less than an hour after she was born and I plan for her to be able to copy code by the time she starts school. Linda caught this picture as Autumn made her first third party transmission on two meters. God has not only blessed us with Autumn but she will soon have a brother or sister so there will be another ham to train in the future. Grand kids are great! I just discovered that if you click on an image that you insert into a blog enetry that it comes up much larger on your screen. How about that sport fans. I'm still learning this blogging thing. I guess that is part of the fun of it. I noticed a few weeks ago that Oakmont had placed a new police car in service. It had been equipped with radios, or at least antennas, and a light bar on the roof. There were no markings on the car yet and it was entirely white. This is not unusual since when the cars are replaced they typically come in plain and are put in service before all of the accouterments are installed. What surprised me was that several days latter I noticed the new car sitting on the paddock in front of the station with blue striped that extended the entire length of the car. None of the other cars have these markings so I wonder if the department is going for a new color scheme? I took the digital camera to work with me this morning and took a snap shot of the new car in front of the station. It now has the logo on the front doors and the rest of the lettering in addition to the new stripe so I think it is complete. I haven’t check the antennas out completely to see if they still have VHF Lo-Band but I know they have VHF High-Band capabilities as well as 800 mHz so that they can communicate with Penn Hills dispatch center. I may stop latter and see if they will let me shoot the interior of the car so I can get a good pictures of the radio control heads. I was reminded twice over this past weekend of something that makes me curious about hams. First came a message on one of the mailing lists that I subscribe to about purchasing a new dual band rig. The person who posted the message wanted to know where would be the best place to order one on line and of those who would have the best price. The second came listening to one of the local repeaters where I heard much the same conversation about a new two meter radio. What is the best place to get one and who has the best price? Now what makes me curious is that, in my view, these two questions may not have the same answer. The dealer with the best price may not be the best place to buy a rig and the best place to buy one may not have the lowest price. Please note the word “may” in my statement. I have written in previous entries about how ham radio operators are some of the biggest cheap skates that I have ever known. I temper that remark with the understanding that as a group hams are an older generation one that by nature is more fugal than current day society. Many are World War Two veterans, grew up during the depression of the 1930’s and so have a different view of the world in general. They have no understanding of or use for our disposable throw away society especially when it comes to hard goods like consumer electronics. Unlike those gentlemen though, some of the newer hams I know and talk with, those of my generation and the current one that came after me, have a different attitude. I think that some of them, again please pay attention to the word “some”, are part of a group that is very materialistic and only thinks of themselves. What is in it for me? This attitude manifests itself in the form of the person that agonizes over weather to buy from dealer A or dealer B because one has an item for ten or twenty dollars less than the other. Don’t get me wrong. I like to save a buck just as much as the next guy. I have my “tipping point” at which I will buy from someone strictly because the price is just too good to pass up. And, I like a free market place and competition since that is how the consumer is best served. What I think is missing in a lot of the current day thinking is what constitutes value. Are you buying from someone who only shuffles the paper work and has the radio drop shipped to your house by the manufacturer or a wholesaler? If the rig show up on your doorstep DOA is a phone call to the dealer going to bring a response to pack it up and sent it back to the manufacturer? If you have questions about your new rig will there be someone on the other end of the phone or even better over the counter that can answer them? I myself prefer to deal with someone who is within “Smith & Wesson” warranty range if you know what I mean. These are just some of the things that are included in the term “value” when shopping for ham equipment. I will grant you there are some things, usually small items, that are commodities and you just shop for the best price wherever you find it. Even in those cases though you might want to consider your favorite dealer when buying. I can tell you from experience in a previous life working for Radio Shack that the margins, or the amount of profit you can make on a given item, can be incredible on some of those little things like resistors, caps, connectors, knobs, hardware and other parts. Sometimes a small local dealer gets by because he makes enough money on the little stuff to carry him between sales of large items. What I’m trying to say with all of this is look at the big picture when you open your wallet or get out the check book or charge card. Make sure that you are not cutting yourself short in the long run by saving a dollar or two in the short term. If a given dealer is good to you return the favor. Clubs are the heart of ham radio and most clubs make a good portion of their annual budget with a ham fest. Do you buy from the dealer or dealers who support your club? If not you should. This is a classic case of penny wise and pound foolish if you save a few bucks on a new rig and short change the dealer that backs your club when they need it. I have bought a number of radios and other items from the AES store in Cleveland. There are a great bunch of guys at that store and I really enjoy going up for a visit on weekends to browse and chat with other hams. I will probably buy from them again in the future. However, when I started looking for a new dual band radio for my wife’s car not long ago Bill, N3BPB, reminded me that KJI Electronics in New Jersey skips the Rochester Ham Fest in order to come to Pittsburgh for the Breeze Shooter’s annual event. They also work with the club on price for prizes at the ham fest. So I gave them my order for a new FT-7800R and they gave me good service in terms of getting my rig to me in a timely fashion. Oh and yes their price was competitive with other dealers and on line stores. If and when I get ready to buy a new HF rig I will probably go back to them again. I realize having said all of that there will still be people out there who will look only at price when buying their next piece of equipment but I hope you will stop and think about how for a few dollars you can make a difference. Not only by voting with your wallet but by letting other hams know how you feel on the subject.